ETHEREUM CLASSIC VISION-THE LONG-AWAITED PROOF OF STAKE OF ETHEREUM IS HERE! Cryptocurrencies are the new digital mode of payment that is spreading to all corners of the world due to the lower rates of transaction fees and the speed at which transactions are made. Miners across a network keep the blockchain network of any cryptocurrency running by confirming transactions that are broadcast unto the blockchain. The two popular consensus protocol are Proof-of-Work and Proof-of-Stake. Proof-of-Work is the consensus mechanism that is used by both Bitcoin and Ethereum Network. Many crypto enthusiasts have shared and expressed all their experiences and difficulties that they face by using the proof-of-work as a consensus protocol. First of all, under the proof-of-work mechanism miners have to solve difficult mathematical computation in order to confirm transactions upon the distributed ledger. In addition, setting up a mining rig to mine under the Proof-of-Work (PoW) consensus mechanism is very expensive looking at the expensive anti-miners that one has to purchase in order to be able to mine cryptocurrencies. One of the factors which contributes to difficulty in mining using this consensus mechanism is the increased cost of electricity expenses. Mining using this PoW consumes huge amount of electricity and this sometimes puts the power supply of some countries into jeopardy and that is why many countries have banned the mining of bitcoin and Ethereum. Satoshi’s main motive for creating bitcoin as a digital mode of payment was to be used as another mode of payment for transactions that are made by everyone. This motive though still in the process of implementation looks not feasible looking at the huge number of transactions that are needed to be performed in in case cryptocurrencies are finally legalized globally. Bitcoin network confirms seven transactions within a second whiles Ethereum confirms fifteen transactions in a second. Even without the whole world adopting to using cryptocurrencies as mode of payment we have recorded several times where transactions have to take longer periods before going through. This situation could go worst if cryptocurrencies are adopted by the masses as a mode of payment for the transactions they conduct. THE SOLUTION THAT ETHEREUM CLASSIC OFFERS TO MINING ON THE ETHEREUM NETWORK. Many crypto enthusiasts have noticed that mining using the Proof-of-Work system was very difficult and sometimes violates a truly decentralized system because only few people are able to make contributions to the network. Hence the Dash Ecosystem was the first of blockchain network to introduce the consensus mechanism of Proof-of-Stake which allowed members to run masternodes on its network. Ethereum Classic Vision has seen the immense benefits of running a masternode system as a hardfork of Ethereum for the following reasons. First of all, mining using the Proof-of-Stake does not involve acquiring expensive and sophisticated devices such as anti-miners which are very expensive. All that members require is to setup a computer and purchase the allocated amounts of tokens required by the network to set up as node across the network. Talk about electricity cost and that would also not be a problem as using Proof-of-Stake consensus protocol does not involve solving any difficult mathematical computations which would require users to purchase anti-miners that consume high amount of electricity. Ethereum Classic also envisions a truly decentralized system where all nodes on the network would make equal contributions to the blockchain and be rewarded equally. Check on the blockchain networks of both Ethereum and Bitcoin and you would find out that some mining pools are always getting rewards frequently. This poses a threat to the network if we have some particular pools controlling over 50% blockchain network. Ethereum Classic Visions solves this situation by creating a decentralized system whereby the network can be controlled by different people all over the globe. This system make it difficult for cyber fraudsters and hackers to attack the network like what has been experienced on some networks in the past. 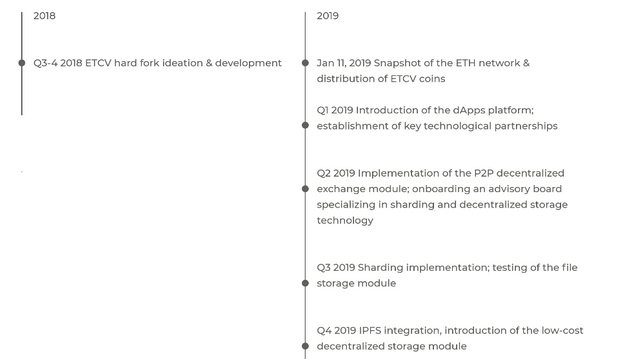 There are so many packages that the Ethereum Classic Vision has for the crypto community, please refer to the whitepaper for more information about this project.